A rectangular, plane, single turn coil ABCD of length 2ℓ and breadth ℓ is arranged as shown, with the plane of the coil in the XY-plane. O is the origin of coordinates and the side AB of the coil is along the X-axis OX such that the X-coordinate of the side DA is 2ℓ. A Magnetic field acing in the negative Z-direction and of magnitude B = K/x where K is a constant and x is the x-coordinate, acts in the entire region of the coil. (a) Calculate the magnetic flux linked with the coil in terms of K, x and ℓ. (b) Calculate the change of magnetic flux through the coil when the coil is rotated through 180º about the side AB. (d) If the coil is moved in the positive Y-direction, maintaining its orientation in the XY plane, what is the emf induced in the coil? Justify your answer. (e) How will you produce a magnetic field (in the region of the coil) of the type given in this question? (You must consider the magnitude as well as the direction of the magnetic field). The above question carries 15 points and you will get 15 minutes to answer it. 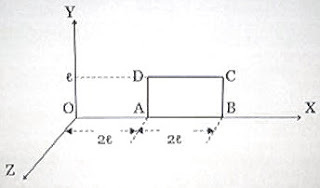 The distribution of points may be as 5+2+3+2+3 for parts a,b,c,d and e respectively. Take it as an exercise and try to answer it within the stipulated time. I’ll be back with the answer shortly. A rectangular loop of wire is moving toward the bottom of the page with a speed of 0.015 m/s. The loop is leaving a region in which a 2.2-T magnetic field exists; the magnetic field outside this region is zero. During a time of 1.0 s, what is the magnitude of the change in the magnetic flux?